When the time comes to replace your unit, you need someone who will take the time to do an evaluation of your home to determine the proper size system, condition of duct work and any other needs your family may have. From warm and cold rooms to air quality and efficiency we will show you what products are available, and how they work to solve your specific needs. We will not send a commission salesman to your home whose only concern is to sell the most expensive product he offers. 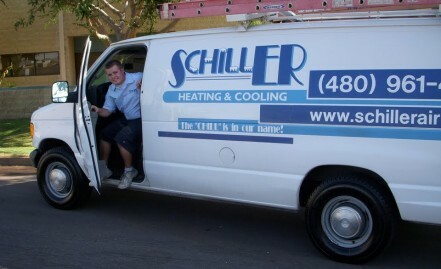 Schiller Heating & Cooling offers many brands of air conditioning systems including Trane and Goodman. Our installation team has many years of experience installing units the right way. We know that it can sometimes be uncomfortable having unfamiliar people in your home. Rest assured that all our associates will take the utmost care to protect your home and belongings while we work. To ensure your new system is hassle free for years to come, we offer ten years parts and labor warranties on almost all the equipment we install. Financing is also available on all brands of equipment we sell. When the time comes for you to replace your system give us a call for a no cost, no pressure estimate. We look forward to hearing from you!